Dr. Rob Bodner, LMT, D.C.
Meet the Ridgeline Clinic Team! Dr. Rob Bodner, LMT #8274, D.C.
Dr. Rob spent his formative years growing up in Beaverton, Oregon. After graduating from Sunset High School, he attended the University of Oregon. He double majored in both Spanish and English. After graduating, he enrolled in massage school, and began his career in healthcare. He moved to Boulder, Colorado, and attended Boulder College of Massage Therapy. After over 1500 hours of education, he was ready to administer therapeutic massage to the public. Shortly after graduating in 2000, Dr. Rob moved to Israel where he studied Hebrew and worked as a massage therapist. A year later, he returned to Portland and has been working as a massage therapist and language interpreter for over 10 years. Dr. Rob discovered chiropractic through a snowboarding injury, that baffled traditional Western medicine doctors for a couple of years. Eventually, he went to a chiropractor and in one adjustment everything went back into place, the pain dissipated, and he could feel the blood flowing freely into the affected area of his neck and shoulder. He has been problem free in that area ever since. After that experience he was convinced of the benefits of chiropractic treatment, and soon after, enrolled in chiropractic school at Western States Chiropractic College and has never looked back. Dr. Rob strives to join his experiences as a massage therapist, and that of traditional Western medicine, with complementary alternative medicine to offer the most holistic and well rounded care that he can give. Billie graduated from East West College of Healing Arts in Portland, Oregon. Her unique and integrative style combines several modalities, including; swedish, deep tissue, prenatal, myofascial release, trigger point and structural integration. Her belief is that through time, due to life activities, physical and emotional trauma, surgery and illness, the human body slowly develops misbalanced and incorrect posture which eventually leads to discomfort, pain and injury. Her focus is in identifying these postural deviations and through several soft tissue/ myofascial modalities correcting and realigning the body allowing the client to move pain-free and with greater ease of motion. When the structure of the body is in proper alignment, less energy is spent in the muscles fighting to regain balance, allowing for higher functioning in all other systems of the structure. She also works with motor vehicle accident injuries, sports injuries, post-surgical rehabilitation, sciatica issues, TMJ and rotator cuff issues. Her more generalized “relaxation” deep tissue work helps to integrate and compliment the chiropractic and acupuncture modalities also offered at the clinic. Erin has always had a passion for history, philosophy, teaching, and the arts. She graduated from the University of Alabama with a degree in English Literature and Theatre and worked as a set designer and painter for several years. During her work at the Alabama Shakespeare Festival, Erin was introduced to massage, the sustainability movement, and to Oregon. On a quest to learn more about planetary health and green living, she and her husband moved to Portland in 2006. She was utterly transformed when she took her first step onto an old-growth forest floor and realized her life would be taking a completely new path. Erin decided to merge her love of the arts and a newfound interest in sustainable healthcare by pursuing a career in massage and bodywork. After recovering from my own injury I became interested in bodywork as pain relief. I would work on my friends after they played street hockey or capture the flag. After much cajoling from them I looked into massage school to become a therapist. Upon relocating to Portland I attended Ashmead college specializing in sports and injury treatment, I was first licensed in 2004. Fascinated by anatomy, I focus on connective tissue / myofascial structure as the key to pain relief. The neuro structure and our ability to unwind that which restricts our movement and quality of sensation is an ever expanding field of study of which I never tire. Modalities practiced include advanced myofascial therapy, positional release, sports rehab, injury prevention, deep tissue as well as side lying pregnancy massage. Whether you are coming in to unwind those tight shoulders or upon Dr. Rob’s direction, Georgia welcomes you with all that’s occurring. As a seasoned manual therapist, Georgia’s massage can offer the range of focussed deep work along with gentle delicate support, depending on what’s going on in your body. Her many years of clinical experience draw from training in craniosacral therapy, shiatsu, myofascial release, and structural integration. Prior to her bodywork career, Georgia’s life was focused on the arts. In fact, it was her love of sculpting the human form that led her to study anatomy which opened the door to her full training in massage therapy. She loves how what’s happening in your body contributes to her lifelong learning as an everyday testimony to the wonders of the body's resilience and ease. She attempts to find balance in her life by practicing Qi Gong, making art and going on long walks. Her warmth (along with her warm stones) and steady presence encourages you to explore even more ways of finding nurturance in your life. I attended East West College of the Healing Arts and became licensed in summer 2012. As my education progressed and my understanding of the benefits of massage deepened I discovered that my passion lies in therapeutic massage. Inspired by the knowledge of Structural Integration and Eastern medicine my massage is a blend of Deep Tissue, Tui Na, Myofascial Release and movement therapies. With each session I strive to provide my clients with an effective, therapeutic treatment to help release holding patterns and increase range of motion and circulation, bringing relief from pain and discomfort, whether it be caused by injury, chronic pain, repetitive movement or the stress of daily life. I grew up in Oregon and graduated from the Portland Waldorf School. At every chance I get I escape to the beautiful deserts and forests of the Pacific Northwest. In my spare time I enjoy cooking, camping, dance, language and travel! Cayly's passion for Chinese medicine grew out of her own healing journey as a patient of acupuncture and herbal therapy. 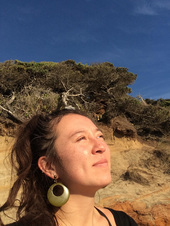 She sought acupuncture as a skeptic initially—a position she quickly abandoned after experiencing a profound degree of personal transformation within only a handful of treatments. Cayly was so convinced, in fact, that she applied to begin classes the following year as a student of Chinese medicine. Cayly earned her Master of Science in Oriental Medicine degree from the National College of Natural Medicine in Portland, OR, graduating with highest honors after completing four years of study in Classical Chinese Medicine. While in school, Cayly worked closely with expert clinicians from a variety of traditions within the field of Chinese medicine. In her practice, she draws from each of these traditions as appropriate to create a treatment that is tailored specifically to the needs of each individual patient. Cayly strives to provide personalized, enjoyable, affordable healthcare to each of her patients. She loves what she does and feels privileged for the opportunity to share Chinese medicine with others on a daily basis. To learn more about her background, education, and treatment philosophy, please visit her website at www.OrganicAcupuncturePDX.com.